The LD90-3 sensors series are based upon the principle of time-of-flight measurement of short laser pulses. 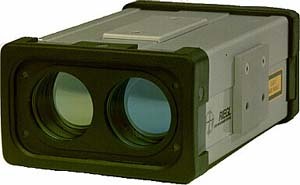 They can be operated with practically any target surface, such as "reflectorless" up to many hundred meters, and with reflecting foil or retroreflectors up to more than 1000 m.
An electrical pulse generator periodically drives a semiconductor laser diode sending out infrared light pulses, which are collimated and emitted by the transmitter lens. Via the receiver lens, part of the echo signal reflected by the target hits a photodiode which generates an electrical receiver signal. The time interval between the transmitted and received pulses is counted by means of a quartz-stabilised clock frequency. The result is fed into the internal microcomputer which processes the measured data and prepares it for the various data outputs. Riegl Laser Measurement Systems, 8516 Old Wintergarden Road, Suite 101, Orlando, FL 32835. Tel: 407-294-2799; Fax: 407-294-3215.